The Priest and the Medium: The Amazing True Story of Psychic Medium B. Anne Gehman and Her Husband, Former Jesuit Priest Wayne Knoll, Ph.D. The Priest and the Medium: The Amazing True Story of Psychic Medium B. Anne Gehman and Her Husband, Former Jesuit Priest Wayne Knoll, Ph.D. The Priest and the Medium: The Amazing True Story of Psychic Medium B. Anne Gehman and Her Husband, Former Jesuit Priest Wayne Knoll, Ph.D.
Psychic medium B. Anne Gehman gave her first spirit readings to her teddy bears at age five. Raised in the Mennonite tradition, she left home at age 14 to finish her schooling. A life-changing near-death experience led Anne to develop her natural gifts, including an uncanny ability to predict future events. She has gained international attention for her help in solving crimes, locating oil and missing persons, healing illnesses, and connecting family members with their loved ones in spirit. She has worked with top government agencies and officials, police departments, judges, and corporate CEOs. While remarkable for her spiritual gifts and experiences, Anne's life is all the more fascinating due to an unusual twist: she is married to Wayne Knoll, Ph.D., a former Jesuit priest. A brilliant student devoted to his faith, Wayne also left home at 14 to join a Roman Catholic seminary. Even while pursuing his life's dream as a professor of literature at Georgetown University, Wayne felt an emptiness that only a woman could fill. After more than a decade of religious training, he made the wrenching decision to leave the priesthood, not knowing if he would find the love he sought. "The Priest and the Medium "shares the remarkable story of two soul mates on parallel paths with divergent beliefs, yet united in their love for God and each other. 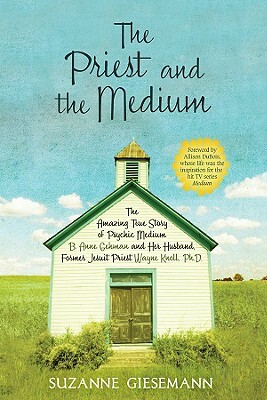 Title: The Priest and the Medium: The Amazing True Story of Psychic Medium B. Anne Gehman and Her Husband, Former Jesuit Priest Wayne Knoll, Ph.D. Author Name: Giesemann, Suzanne R.